My friend Meg first suggested I read this book more than a decade ago. I never got very far into the story. I was overwhelmed by the prose, and I couldn't identify with the protagonist's mid-life angst. Needless to say that has changed. Charlie Citrine's musings on his own life as he reflects on life and death of his friend Humboldt ring true now despite the book being anchored in the 1970s. Charlie's literary career has faltered after reaching a high point with a Broadway play and subsequent movie. The play was based on the poet Humboldt, who never saw the same level success as his protegé and deeply resented Citrine. Humboldt's descent into mental illness only serves to distance him from loved ones and mask the essential truths in his ravings. Saul Bellow won the Pulitzer Prize for this book. The story was based on Bellow's own relationship with the poet Delmore Schwartz. The book has big themes on the corruption of materialism and the vulnerability of the arts. The book ages well. Chicagoans will delight in references to locations long gone, but the city's essential personality is solid. New York is also well-served with key locations in Broadway and the Village. But most importantly, the story is timeless. If you are inclined to stop and reflect on your life thus far, Humboldt's Gift will serve you well. For those of you in New York, Broadway offers more such contemplations with the repertory performances of "Waiting for Godot" and Harold Pinter's No Man's Land with Patrick Stewart and Ian McKellen @ the Cort Theater. Saul Bellow (1915-2005) was born in Canada but moved to Chicago as a child. He studied at the University of Chicago (where he later taught), Northwestern University and did some graduate work at The University of Wisconsin. In addition to the Pulitzer Prize, he was awarded the Nobel Prize for Literature in 1976. He has also won the National Book Award three times. Open City is a contemplative book that unfolds in a slow canter. It reads like a non-fiction diary of a Nigerian immigrant's doctor's life in New York City, but it is a novel. The book opens with an explanation as to why the young psychiatry resident takes up walking and navigating the city as an escape from the pressures of his work. From there we meet an old professor whom, the doctor visits on a walk to from Harlem down Broadway to Columbus Circle. He ducks into a Central Park South high-rise to escape the marathon throngs as he is walking on Marathon Sunday. New Yorkers will appreciate the small details that he observes on the walks. All readers will appreciate the unexpected encounters with foreign lands as the doctor talks with other Africans, tells of stories of his homeland and a trip to Brussels in search of an estranged grandmother. Interspersed are stories of Julius' patients and their manias, sorrows and sins. The book reads so true that at first I worried that he was breaching patient confidentiality in confiding patient's stories. This is an immigrant's story, Cole is a master of prose and telling that unique story of being a foreigner in a strange land -- city. Teju Cole came to United States from Nigeria in 1992. Open City, his first novel, was a PEN Hemingway winner and a National Book Critics Circle Award finalist. 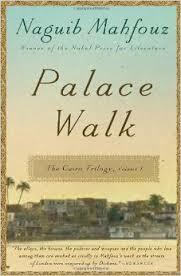 Palace Walk is part of Naguib Mahfouz' trilogy that follows three generations of an Egyptian family across the two World Wars. As the Arab Spring has devolved into the ousting of President Morsi, this historical fiction is a great primer on how life in Cairo was and is today. Mahfouz story centers on the lives of the el-Gawad family. The original translation of the title was "Between Two Palaces," which speaks to the changing times. The family is run by a tyrannical father, and includes an obedient wife, three sons and two daughters. The hypocrisy of culture wears on the family as the father indulges in forbidden behaviors. The corruption of the family echoes the corruption of a culture and forces the children to make choices that break tradition--as well as uphold it. Like any great generational novel like The Thorn Birds or Wild Swans, Palace Walk is a rich way to experience a different culture and gain an appreciation of your own life. This was a book club selection from my original Chicago group and makes for a great discussion. Naguib Mahfouz won the Nobel Prize for Literature in 1988. He died in 2006 having published more than 30 novels and 350 short stories. He has also crafted several movie scripts and plays. Any fan of Pat Conroy's work already knows a lot about his dad. The abusive, self-proclaimed "Great Santini" achieved added notoriety when he was portrayed by Robert Duvall in the movie bearing his nickname. Even the most loyal reader may wonder what else Conroy could possibly have to say about the man, especially when they see his new memoir is a whopping 336 pages. Simply answered: a lot. The Death of Santini explores what it’s like to write about loved ones who aren’t shy about their reactions and what it’s like for them to be written about,” observes The New York Times review. Again, this is saying: a lot. 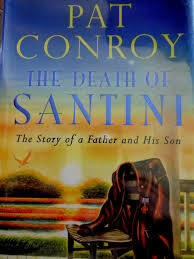 While the publication of The Great Santini brought Pat much acclaim, the rift it caused with his father, Don Conroy, brought even more attention. Their long-simmering conflict burst into the open, fracturing an already battered family. But as Pat tenderly chronicles in The Death of Santini even the oldest of wounds can heal. In The Death of Santini Conroy examines not only his father, but also his much-loved mother and his siblings, including the brother who killed himself by jumping off the tallest building in Columbia, S.C., and his sister, a poet (he hasn't spoken to her since their mother's death in 1984). Pat Conroy and his family moved constantly during his youth, and it was while attending Citadel Military Academy in Charleston, South Carolina, that Conroy wrote and published his first book, The Boo, about a favorite teacher. His works include, The Lords of Discipline, The Prince of Tides, Beach Music, My Losing Season, The Pat Conroy Cookbook: Recipes of My Life, South of Broad, and My Reading Life. He lives in Beaufort, South Carolina.